Catherine (Catharine) Brunjes (dob circa 1784) daughter of Heinrich Brunjes of Wachholz. 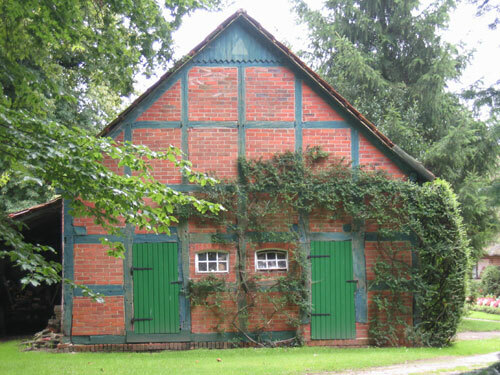 Wachholtz (Wachholz) is a suburb (or an estate) of the town of Beverstedt. There is no record for the baptism of Catherine Brunjes the daughter of Heinrich Brunjes in Lehe. Based on an age of twenty at the time of her marriage, Catherine was born no later than 1784. Gerhard Blanck was born in 1777. Heinrich Brunjes, for whom records exist in Lehe, died in 1770. It, therefore, seems unlikely that Heinrich Brunjes in the records in Lehe was the father of the Catherine who married Gerhard Blanck. The Heinrich Brunjes who was the father of Catherine Brunjes, was not baptized in Lehe, he did not marry in Lehe and he did not have children in Lehe. Marriage: Johann Friedrick Brunjes married Anna (last name unknown), date and place, unknown. Trieneke: The date, place of birth, and mother of Trieneke Brunjes are unknown. Based on an age of at least 20 at the time of her marriage in 1763, Trieneke was born 1743 or before. The records for the period of her birth are missing from the Lehe records. In addition, it is possible she was not born in Lehe. Marriage: Trieneke, the daughter of Friedrich Brunjes, married Carl Berend Meyre (? ), widower, on May 6, 1763. Note: Neither of the Heinrich Brunjes who were witnesses to this baptism could have been the Heinrich Brunjes listed below, as he died in 1770. The death of the Ann, the widow of Friedrich Brunjes: Anna Brunjes, the widow of Friederich Brunjes died March 11 and was buried on March 14, 1776, age 75 years, 2 months and 3 days. Note: This would mean Anna was born in 1701. Too early for the records in Lehe. Based on his death record, Heinrich Brunjes was born in 1729, place unknown. It is possible that he was not born in Lehe. Marriage: Rebecca (last name unknown), date and place unknown. Death: Friedrich Jacob Brunjes, son of Heinrich Brunjes and Rebecca died on May 12 and was buried in Lehe on May 17, 1759, age 1 year and 6 months. Note:	This is the first record for the name Brunjes in the parish. Since the baptism of Friedrich Jacob Brunjes was not recorded in Lehe it could indicate that the Brunjes family moved to Lehe circa 1758. Anna Rebecca Brunjes, daughter of Heinrich Brunjes, schif--- (this occupation has something to do with boats, it may be an inland waters sailor, schiffer) and Rebecca (no maiden name given) was born on the 9th and baptized on April 10, 1760, witnesses: Fedde Fedder, Christopher Muller, Anne Brunjes, Magreta Muller and Konike Schuslers. Death: Anna Rebbecca Brunjes, age 2 years, daughter of Heinrich Brunjes, schif---, and Rebecca, was buried on October 25, 1762. This was the only appearance of the name Fedden in the Lehe records. Christopher Muller was a carpenter. His wife was Becke. There are several baptisms and a death listed for the family of Christopher Muller in the Lehe records. The were Schuslers in the records. Death: Johann Friedrich Brunjes, son of Hinrich Brunjes, schif--- and his wife, Rebecca, died February 26, and was buried on March 1, 1765. Carsten, the son of Heinrich Brunjes, schif---, and his wife, Rebecca was born on April 4 and baptized in Lehe on April 5, 1766, witnesses: Jacob Eden, Reimeld, (?) Scha?er, Christian Meirers, Barbara Luers, Albert Norden. Death: Buried with his mother April 14, 1766. Note: All the children of Heinrich and Rebecca Brunjes, whose baptisms were recorded in Lehe, died and were buried in Lehe. Did they have other children who were baptized in another parish or whose baptisms occurred in a year when the records are missing? See below for more on the Brunjes in Lehe. Rebecca Brunjes, wife of Heinrich Brunjes, was buried on April 14, 1766, age 34. As near as I can make out, her 8 day old son Carsten was buried with her. Note: Rebecca was born was born circa 1732. The widow, Heinrich Brunjes, schif---, married Rebecca Dutschen, the daughter of Jurgen Dutsch, on February 26, 1767 in Lehe. One of four marriage recorded that year. Johann, son of Heinrich Brunjes, schif---, and his wife, Rebecca, was baptized in Lehe on November 11, 1767. Witnesses: Johann Dutsch, Reimeth Schusler, Heinrich Brunjes, Frienike Eifs and Luke Schuslers. Marriage: "Youngman", Johann Brunjes, son of Hinrich Brunjes -------, married Anna Rebecca Kosters, daughter of Heinrich Kohters on January, 1797 in Lehe. ✟ Heinrich Brunjes, son of Johann Brunjes and Anna Rebecca Koster was baptized on March 18, 1798 witnesses: H. Hanekes, J. H. Vollers, and H. Heneken. Heinrich had a twin brother Johann Georg. Death: Heinrich Brunjes was buried on April 1, 1798, age 4 months. ✟ Johann Georg, baptized the same day as Heinrich, witnesses: ? G. Fischer, B.F. Meyers and G Hehn. Death: Johann Geog Brunjes was buried April 29, age 6 months. Marriage: "Youngfellow", Heinrich Brunjes, the son of Johann Heinrich Brunjes, married Anne Dorothe Tardel on March 11, 1831. ✟ Johann Heinrich, born January 2, and baptized January 22, 1832, Can't read sponsors. Death: Johann Heinrich Brunjes died on July 30 and was buried on August 3, 1835, age 3 years and 7 months died of "brustkrankheit" (consumption). ✟ Heinrich baptized on October 7, 1833. Writing is bad, can't read witnesses. Diedrich Heinrich born August 3 baptized September 4, 1836. Can't read witnesses. Anna Rebecca, born March 14, baptized March 22, 1838. Can't read witnesses. ✟ Georg Heinrich, born January 16, baptized January 17, 1841. Can't read witnesses. Death: Georg Heinrich Brunjes, son of Heinrich Brunjes and Anna Dorethe Tardel age 3 years and 5 months died on June 25 and was buried on June 29, 1844. ✟ Mina Friedericka born January 16, baptized January 17, 1841. Can't read witnesses. Death: Mina Freidericka Brunjes age 9 months and 5 days, the daughter of Hinrich Brunjes and Anna Dorothes Tardel died on October 21 was buried October 26, 1841. ✟ Maria Dorothe the daughter of Heinrich Brunjes and Dorthe, nee Tardel, was born on May 15, and baptized on June 5, 1842. No witnesses. The page may be missing. ✟ Heinrich Ludwig, the son of Heinrich Brunjes and Anna Dorethe, nee Tardel, born March 5 and baptized on March 15, 1849. Witnesses, Ludwig___, Johann ___, Anna Elizabeth Lubmann (?). Death: Heinrich Ludwig Brunjes, the son of Heinrich Brunjes died on March 17, and was buried on March 22, 1849, age 12 days. Niclaus, son of Heinrich Brunjes, schif---, and his wife, Rebecca, born January 2 and baptized in Lehe on January 3, 1770 witnesses: Carsten Bohls, Heinrich Eiter, Metta Dittmers and Anne Adelheit Hollen. Death: Niclaus, son of Hinrich Brunjes, died at age 6 months and 20 days and was buried on July 26, 1770. Heinrich Brunjes, schif---, died on the 10th of January 1770 and was buried on the 16th January, age 41 years, 1 month, and 16 days. Note: This would mean he was born in 1729. Birth: Circa 1761, daughter of Carsten Brunjes. Note: Heinrich Brunjes and his wife, Rebecca, had a son Carsten in 1766. Carsten is not a very common name in the Lehe records. Catherina Margaretha baptized April 25, 1785, witnesses: Joh. Nicol. "Labuschor", Meine Herbolts, Luke Meir, Margaretha Hulseberg. No listing for Bushmann in Die Einwohner des Flecken Lehe 1827-1875. Diedtich Hinrich Casten Buckmann, Arbeiter, Lehe son of Dieterich Buckmann, Brinksitzer and Margarather Adelhied Kohler0 Englen 30.8.1834 married Katherine Metta Oelkers, Bremen. Marie Brunjes died on September 23 and was buried on September 27, 1808, age 68 years. This means she was born circa 1740. Who was she? Why did Catherina Brunjes marry in Lehe if Heinrich Brunjes was from Wachholtz (a town about 25 miles southeast of Lehe in the parish of Beverstadt)? Did Catherine's father, Heinrich Brunjes, ever live in Lehe and, if so, for how long? Was their any connection between Catherine Brunjes (the wife of Gerhard Blanck), her father Heinrich Brunjes and the other Brunjes in the Lehe? What was the connection to Catherine and Hinrich Brunjes to the other Bunjes in Wachholz? Catherine Brunjes was born no later than 1784. The marriage record to Gerhard Blanck indicates that she was the daughter of Heinrich Brunjes of Wachholtz. Since the records for Brunjes in Lehe are so sparse, it is most likely that they were recent immigrants from some other city or town. It is possible that they were related to the Brunjes of Wachholz. I did not find any records for Brunjes in the Beverstadt records which should have included the records for Wachholz. There are other Brunjes in the censuses in Brooklyn. Wachholz is a small "village" just outside the town of Beverstedt about 25 miles south east of Lehe. The village today is mostly "new". There is no church and only a few old buildings. There were 6 Brunjes listed in the phone book in Beverstedt (which includes Wachholz) in August 2005. There were 17 Brunjes listed in Bremerhaven. The present church of Saints Fabian and Sebastian in Beverstedt dates from 1851. My mother's family (Nobbe Family) originally came from Wachholz where they owned a property. There are Bruenings and Bruenjes (which according to my family is a former name which resulted in Bruening) in our family, which might suggest a connection." Anna Margarete Wilhelmina Bruening, the daughter of Hermann Bruening and Katharina Roenner, dob 2/3/1839 - died 15.1.1919 Wachholz, married Konrad Heinrich Nobbe on 26/7/1860. gedbas.genealogy.net has the following entries for records in Wachholz Beverstadt. I am not sure where the information comes from. Anna	STEMMERMANN born 28. February 1671 father Harmen mother Margret N., Kirchwistedt, Börde Beverstedt, Niedersachsen	married Hinrich Brünjes 8 November 1692 Beverstadtdied Wachholz (Ksp. 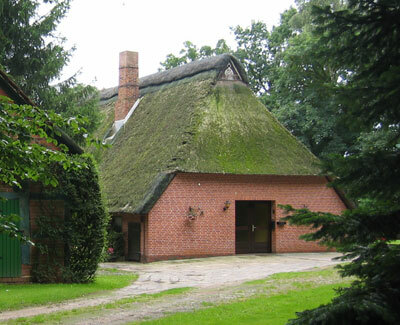 Beverstedt), Börde Beverstedt, Niedersachsen,	STEMMERMANN - N.
genealogy.net lists - Trine Liese BRÜNJES born in Wachholz, Beverstedt married Marten HINKEN born 1698 in Hulseberg, Kirchspiel Scharmbeck oo 25.11.1723 in Scharmbeck, St. Willehadi	- No children found. Brunjes have lived in Frelsdort since 1700 . At that time a Brunjes family lived on the Wachholz and Abelhosrst estates at Beverstadt. The name Brunjes has not been correctly entered in the church records the name was entered as Brunigs instead of Brunjes. Today the Frelsdorfer line used the name Bruning. Albert Brunjes the son of Johann Brunjes and Ilse Margarete Eleonore born Roes, Frelsdorf and Metta Lucken daughter of Hinrich Lucken and Rebekka born Tienken, Hipstedt were married 8 November 1822. The had 3 daughter and 2 sons. The subsequent genealogy of this branch is included in the Krankenberg's book. Brunjes is most likely a patronymic name - son of Brun-.